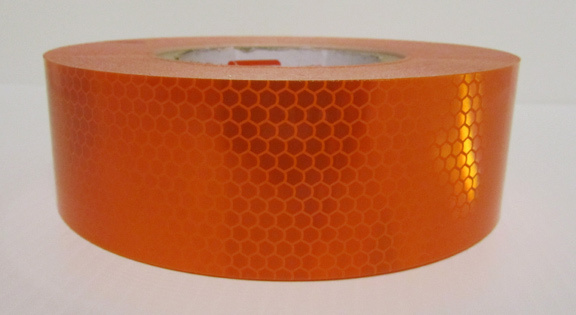 Orange reflective tape is often used on emergency vehicles like ambulances. It is also used on fire hydrants, bollards, signs, gates, dumpsters and other objects that need to be seen at night. 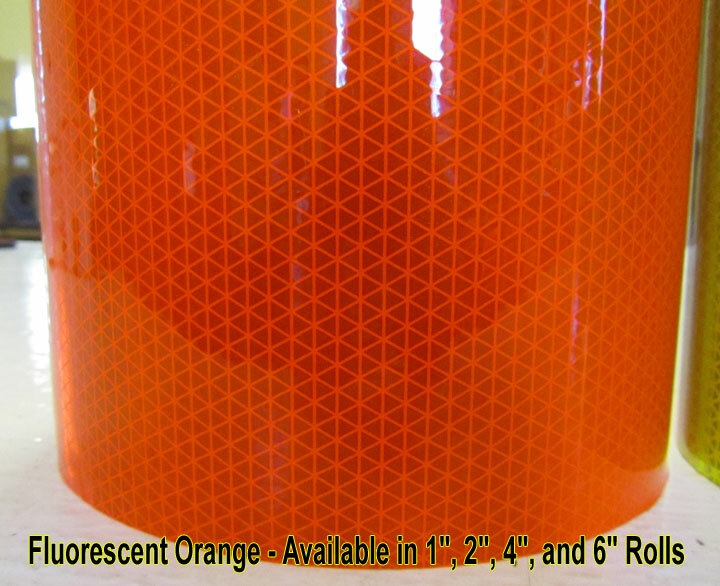 We carry Orange reflective tape in 1″, 2″, 3″, 4″, 6″, 8″, 12″ and 24″ widths. Colored tapes are not as bright as white tape but they do have the advantage of reflecting a color that in turn sends a message to the viewer. Orange often designates caution or a work zone which is why traffic cones and barrels are this color. White is bright but often looks like a car headlight. The tape above is called V82 by Reflexite. It is also known as AP1000. It is Reflexites (Orafol) top of the line film. It has an aggressive adhesive and a 10 year outdoor life. To apply you simply peel the backing off the tape and apply it to a clean, dry surface. 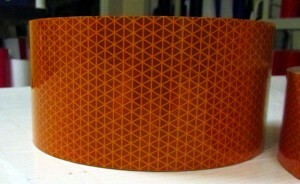 It is a Type 5 tape and reflects at 280 candelas. Pictured above is our V82 (AP1000) orange, then our fluorescent orange and finally our V92 Orange. V92 and V82 are about the thickness of two sheets of paper. The V98 fluorescent orange is about the thickness of a business card. V82 orange has a brightness of 280 candelas. V98 fluorescent orange reflects at 200 candelas and V92 Orange reflects 185 candelas. 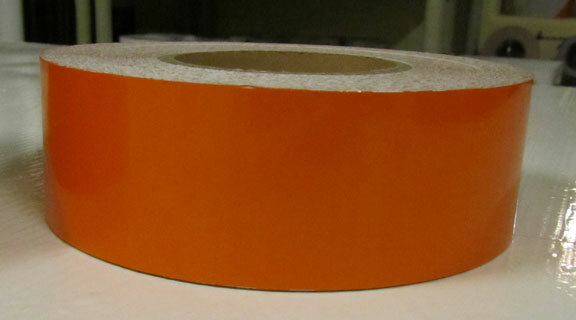 The roll of tape above is an example of our orange high intensity or HIP prismatic material. It is a type 4 tape and has a 10 year outdoor life. It reflects at about 200 candelas. The color is more vivid because the tape is an air back prismatic versus a metalized film. This simply means that the prisms sit on a cushion of air and a white background resulting in sharper more vivid colors. 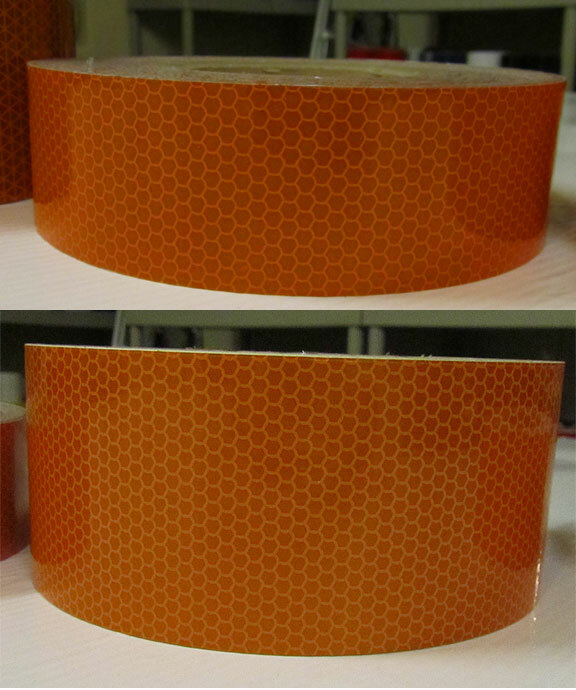 The High Intensity Type 3 Orange rolls (pictured above-top roll) have the honey comb pattern and use microscopic glass beads to reflect light. Orange High Intensity reflects at at rate of 100 candelas. It is a 10 year rated tape. 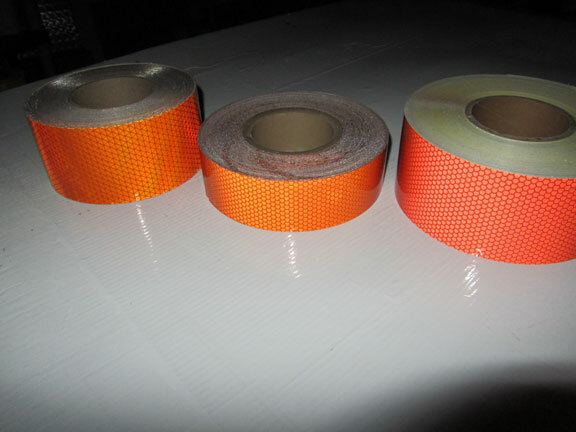 Flexible High Intensity orange (pictured above-bottom roll) is very similar to standard high intensity but has the advantage of being stretchable and reboundable. 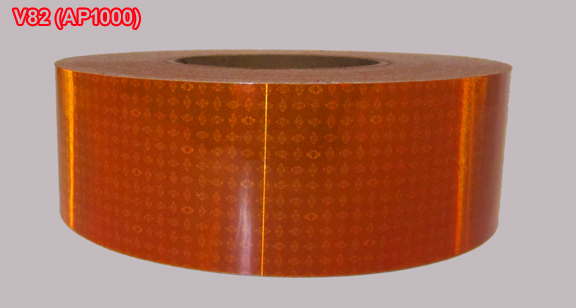 It is used on road barrels and other applications where if hit, the tape needs to bounce back to its original shape without failing. 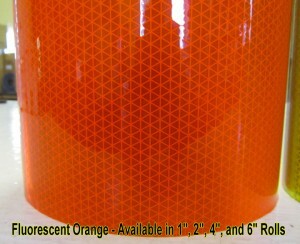 Flexible high intensity orange also reflects at 100 candelas. Flexible high intensity can be CAD cut. 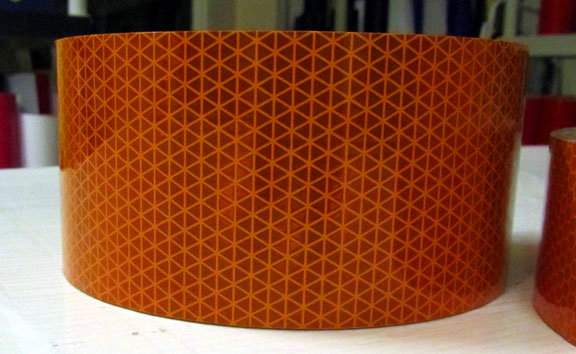 Lastly, our flexible engineer grade orange reflective reflects at approximately 54 candelas and is our most affordable class of tape. It has no pattern and is widely used for vehicle graphics, letters, numbers and striping. Flexible engineer grade can be CAD cut.